In the mid 1800's, Hacienda Carmen was owned by José Picó Pomar (1820-1905), a Spanish immigrant from Manacor in the balearic island of Mallorca, he also owned Ingenio Soledad in Coamo. In 1863, some of Picó's properties, including Carmen and his Coamo residence built in 1840 on the corner of Ignacio Quintón and Mario Braschi streets pictured below, were acquired by Clotilde Santiago (1826-1909). During the second half of the 19th century, it functioned as one of Puerto Rico's most active and important import-export centers with store and storage space at ground level and residence quarters above. During the Spanish-American War the house was occupied by Lt. Col. Rafael Martínez Illescas of the Spanish army, who was killed in the conflict, and later by U.S. General James Harrison Wilson (1837-1925). Hacienda Carmen operated until 1912, three years after Clotilde's death. Clotilde acquired Carmen ca. 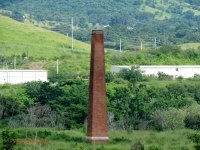 1860 when it had a blood driven mill, in 1878 he installed a steam driven mill making it the largest "trapiche" and one of the first mechanized in the Coamo region. The wooden barrels used to pack muscovado sugar were manufactured on premises, they were transported on a daily basis to Clotilde's business on the ground level of his residence where the sugar was marketed. 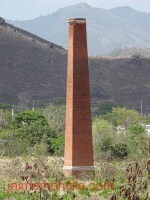 Clotilde's sons had plans to establish a Central sugar mill in Coamo but the sugar crisis of 1912-13, in part due to issues with US sugar tariffs, derailed the project. The March 16, 1912 edition of the Louisiana Planter and Sugar Manufacturer reports that: "Still another small proposition has come up within the last week, which is a similar plant to the above (referring to a proposition by the Cidra Sugar Co. for a plant near Caguas) to be established at Coamo on the lands of Santiago Hermanos, who are very large landowners and at present operate a small factory of their own, grinding their own cane and making the final molasses into alcohol. Their plant is, however, quite a small one and very much out of date, there being none of the later improvements such as multiple crushing, triple effect nor crystalizers." 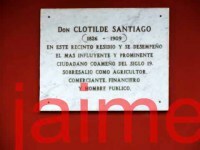 As evidenced by the placque on the house, Clotilde was the most prominent citizen in Coamo during the second half of the 1800's.